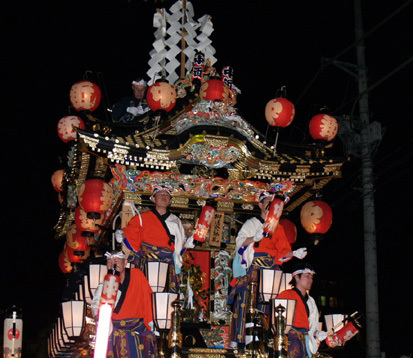 A decorative float burdened with singers makes it way down the streets of Chichibu, two hours northwest of Tokyo. 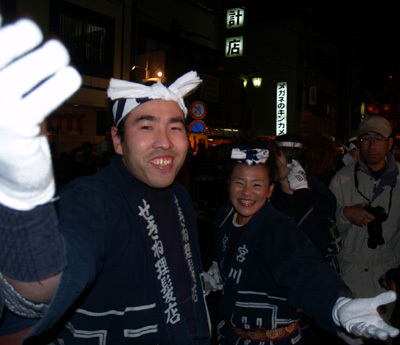 The Chichibu Yo-Matsuri (Night Festival), dating back to the 18th century, is one of the three most famous night festivals in Japan. The small city of Chichibu lies two hours northwest of Tokyo in the mountainous regions of Chichibu National Park. Despite the cold, large crowds descend upon the city every year in early December to see the colorful, illuminated floats parade through the streets. 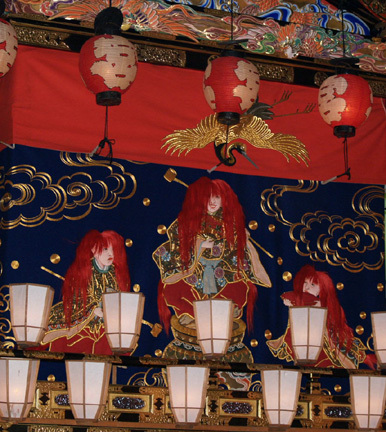 Six massive decorative floats festooned with a myriad of lanterns are pulled through the streets by large teams of men and women in festival attire. The floats weigh nearly ten tons and some of them are over 30-feet high. These floats require teams of nearly a hundred people pulling and pushing to get them moving. 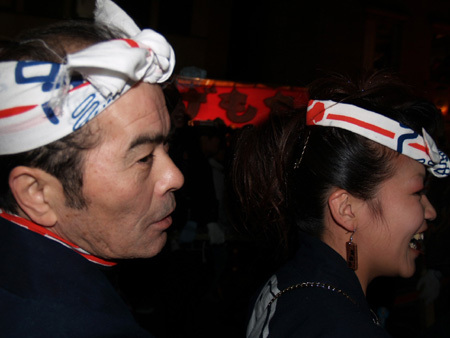 In front of the floats two long lines of people pull on large ropes while chanting "Wa-shoi! Wa-shoi!" (which is like saying "Heave, ho!"). Between them, walked colorfully-attired men rhythmically clacking wooden blocks together. 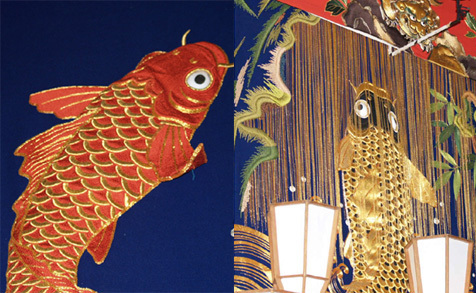 On the floats themselves, groups of singers waving handheld lanterns chant and shout as they pass by. 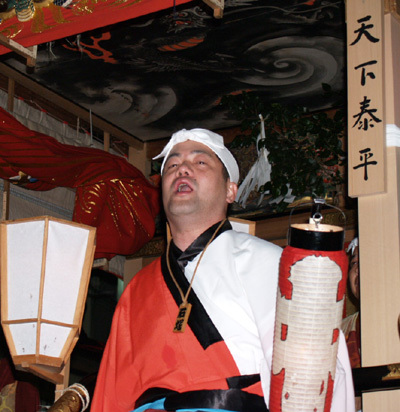 On each float a taiko drum is beaten furiously, accompanied by wildly shrilling flutes. 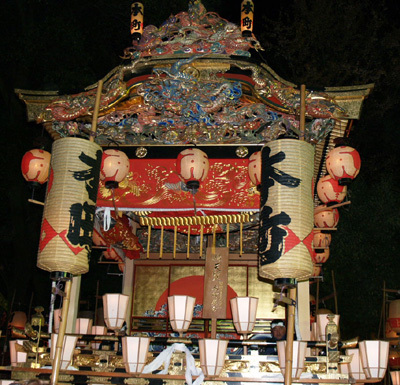 On top of the float, sometimes a man stands waving a folding fan to the rhythm of the taiko drum and flutes. Occasionally, the parade hits a bit of a snag much to the relief of the rope pullers and float pushers, no doubt. Some of the rope pullers tried to bamboozle yours truly into pulling their seven-ton float, but I sheepishly declined, claiming an allergic reaction to physical labor. The floats eventually come to a small, but steep hill where pullers and pushers have to gather up a surge of energy to yank their heavy float to the top of the hill, which also marks the end of the parade. South of the parade, fireworks light up the cold night sky. Below, dozens of temporary food stalls serve up piping hot food and drink to the thousands of visitors. 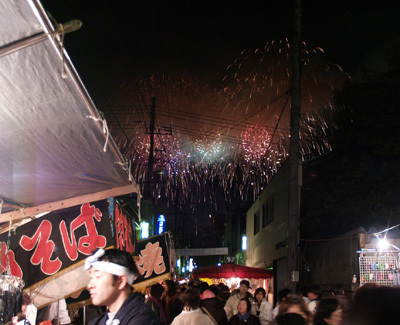 The Chichibu Yo-Matsuri is definitely a festival to experience. However, festival-goers should be wary of the earliness of the last trains back to Tokyo. The last trains back end around 10:30. This I did not know. When I took a train at 10:40, I reached a station that was still a good ways out of Tokyo and remained there until the next morning. I ended having to take refuge from the cold in an all-night "Manga-kissa" -- Internet/comic book cafe.